A lot of data out this week about the comics business. Brian Hibbs has his fifteenth (!) 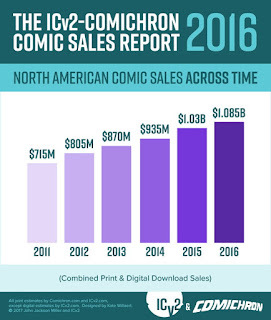 annual Bookscan report at ComicsBeat, where he finds the top 750 graphic novels in the book channel stores the service surveys up 3.44% in units and down the same in dollars. The overall category sits at $302 million, up 2.97% — but possibly not, as his 2016 data set was missing some items. Brian's definition of comics may not match mine in every single case, but it is consistent from year to year, and it does suggest that while Direct Market sales were down in 2017, the book channel's fortunes were better, although not by enough so to pull the year positive. Our year-end report with ICV2 for 2016 found the business at $1.085 billion; while the 2017 report is yet to come, it's probably a safe bet that the total will be down, but remain above $1 billion, likely above every 21st century year through 2014. It's not correct that there are as many pieces written about the structure of the comics market as there are pieces about the comics themselves, but a down year certainly enhances that feeling. I received such pieces in the mail weekly to Comics Retailer magazine in the 1990s, and then by e-mail — and then saw them all move online. Last week's essay from Augie de Blieck is one of the latest entrants, engendering a response this morning from Heidi MacDonald which also takes in the Bookscan data. Time only occasionally permits me to comment, and almost never to blog on my own, as a look at the history here will show. But I would quickly like to make an observation about the nature of comics retailing business today, as distinct from when it began. I used to run articles in Comics Retailer magazine from Mel Thompson, who ran the retail services firm ComTrac, and I miss the kind of street-level data he shared on comics shops because I believe, more than ever, that Direct Market shops are so variegated that only the most profound systemic shocks affect them equally. Every shop is its own microclimate, its own micro-economy. What does that mean? In practical terms, it means for every shop's current successes or problems, you can usually throw in a contributing positive (i.e., robust back issue trade, tournament gaming destination) or negative (i.e., skyrocketing downtown rents, failure of a sideline business) factor that helps to explain them. And I think that points to something that happened since the birth of the Direct Market, which is the collapse of the mid-1990s — a near extinction-level event that we definitely can say took down good shops and bad, new and old, regardless of extraneous factors. The shops that emerged from that period had evolved either to really zero in on a particular local clientele, or had further developed sideline categories to insulate them. They went deep, or went wide. The very earliest comics shops were highly individualized, having their origins in other kinds of businesses — but the shops that opened in the 1980s, once the model was established, were more likely to look alike. That's not so much the case in the 21st century. 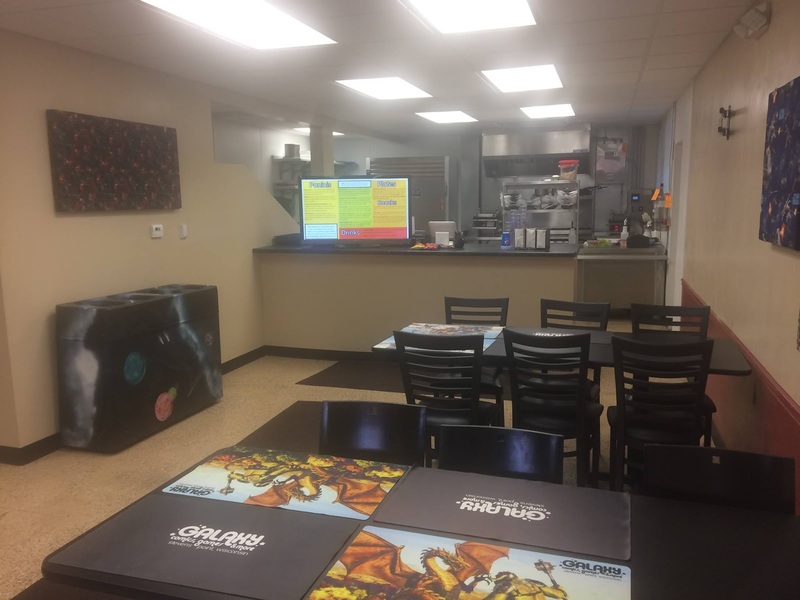 My local Direct Market outlet is a full service store for new comics, but also is a gaming store and, oh yes, a gourmet sandwich shop. Probably not a lot of other stores share that specific combination! This is why I think accurate diagnoses of the business as a whole tend to be hard to make — and where looking at systemic factors and solutions tends to fall down: we know how big the Direct Market is, but we don't know to what degree stores nominally in that market are exposed to its forces. Even a possible paper tariff war, the specter of which was raised earlier this week, would be somewhat uneven in its impacts. There just aren't many facts discernible from 30,000 feet that obtain for all shops in the system. The last Direct Market peak is less than two years old, and dates from the DC Rebirth launch. We know Marvel's sales have been off since then, and that graphic novel sales have also been off — or at least, that retailers haven't bought as many books from Diamond. We know this March is probably going to be off simply because it has one less shipping week. We also know the margin of the year-over-year losses, while certainly meaningful if your store is more impacted, does not suggest a 1990s-style epidemic of closures. We also know this might change — or that it might not. That's about all the information we can really be confident about — and it probably does not support more sweeping observations, pro or con the current arrangement, but that's my own judgment. A quick note on the aftermarket, which I can speak about with more confidence: while de Blieck may not be finding back-issue bins much in evidence, the aftermarket is in the mix for many stores, even when the stock isn't on the floor. The back issue market — in stores, conventions, and eBay -- is in the nine figures annually, and is probably larger than digital. Chuck Rozanski reported Tuesday that Mile High Comics sales are up 68% month-to-date. Again, a unique microclimate and sample size of one; worth exactly that. But one of the strengths of periodical comics is they are double participants, in both the front- and aftermarkets; a distinction every other kind of magazine publisher would be thrilled for their products to have.